All transactions are safe and secure with a reliable history in online purchasing behind each of our associates. 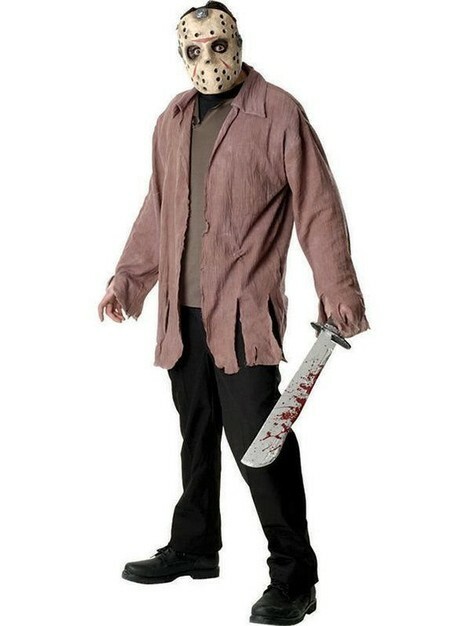 Buy the Jason Voorhees Costumes and Masks to own Friday the 13th clothing and merchandise. Wear your favorite horror tee under one of these Friday the 13th costumes, which include Jason's hockey mask, the most recognizable part of his outfit. The outfit on the left ships with the Friday the 13th mask, a tattered blue jacket and a brown top. Jason's machete is sold separately. Other costume styles include the Jason Big Bruiser and the Ms. Voorhees costume, which together make a fun couples outfit. They're perfect to wear overtop one of the Friday the 13th t-shirts displayed here, and they'll surely catch the attention of both fans and non-fans alike. Also see the related machete. In addition to the Jason Voorhees Costumes and Masks above, browse the Friday the 13th Clothing Gallery for more apparel like men's and women's clothes, kids shirts or hoodies.